Many steganographic systems embed hidden messages inside the least significant bit layers of colour natural images. The presence of these messages can be difficult to detect by using statistical steganalysis. However, visual steganalysis by humans may be more successful in natural image discrimination. 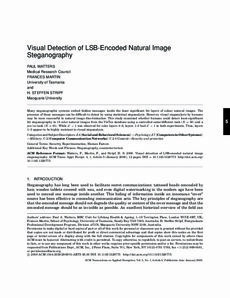 This study examined whether humans could detect least-significant bit steganography in 15 color natural images from the VisTex database using a controlled same/different task (N = 58) and a yes/no task (N = 61). While d' > 1 was observed for color layers 4-8, layers 1-3 had d�' < 1 in both experiments. Thus, layers 1-3 appear to be highly resistant to visual steganalysis.